People world-wide wonder why God allows evil to exist. I am somewhat amazed and slightly amused at this question; but mostly I am perplexed that, on the one hand, people think that God should allow you and me to live as we please, but on the other hand, he should keep other people from doing whatever they feel like doing. Does that sound about right? You see... here's the deal... if God were to disallow us complete freedom of choice, then we would simply be his puppets... and I know darn good and well that people would cry "Foul!" and say that it isn't right or fair. So God gives us complete freedom of choice and what happens? People cry "Foul!" and say it isn't right or fair. Do you understand why people think this way? Mainly it is because nobody wants to be held accountable (ie: responsible) for what they did or failed to do (for doing wrong and/or failing to do what is right and good). Yet these same people want to hold the other guy responsible for his or her actions. And if they don't know who to blame, then they blame God for allowing people to make wrong (bad, improper, immoral) decisions. They blame God for allowing evil in the world. Go figure! It is natural that we should desire to live in a "perfect world," for we are created in the image of our Creator. God wants us to live with him in His perfect world (kingdom) and everyone has that opportunity. 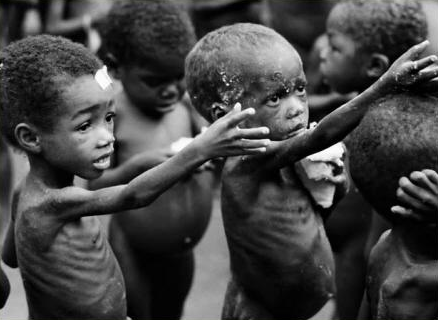 Let me ask you, are you one of those who wonder why God allows bad things to happen to good people? Do you think it is wrong that bad things should happen at all? If so, then what are YOU doing about it? Are you simply sitting back, wringing your hands and saying, "This should not be!" or are you proactively seeking ways that YOU can make the world a better, more perfect place to live? 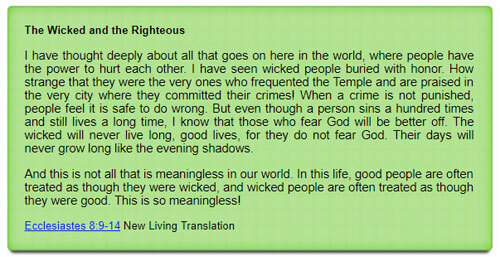 Do you understand WHY the world is full of evil? Have you looked in the mirror recently? Do you lie, cheat, steal, curse, etc.? Do you rationalize, minimize, and justify your actions? Do you console yourself by thinking that at least you are not as bad as some other people? Do you realize that as long as you are self-centered instead of God-centered that YOU are practicing evil? Do you know where that evil comes from? But take heart! All is not lost! The heart can be healed and we can live in a perfect world. But in order to do so, we must seek God and His desire (will) for us. Then we must seek to live according to His will instead of our own (God-centered instead of self-centered). And what is His will for us? To LOVE HIM above all else and to love others as much as we love ourselves. (See Mark 12:28-34 and Matthew 10:37-39). Many people would prefer to find fault with God rather than take a look at their own life and their own heart. They fear being held accountable for their actions and/or inaction, so they try and hold God accountable for all that they see wrong in the world. It is not the heart of God that is the source of life's troubles; it is the heart of man. Mankind could (and should) be taking proactive and preemptive action to alleviate the injustices man perpetrates on man. 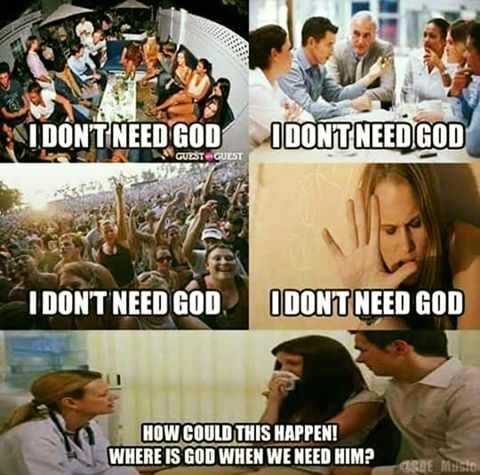 But it is much easier to sit back and blame God for everything under the sun that doesn't accord with how and what we think God should and should not be involved in. At the end of the day, the real issue for those who follow Christ is will we trust God even if we don't understand or appreciate the decisions He makes and the things He allows? The issue is so important an entire book in the Bible -- the book of Job -- is devoted to this concept. Is God good only when things are going well for you, or is He good all the time, even if your blessings are stolen or destroyed by some disaster? That famous survivor of the Nazi concentration camps, Corrie ten Boom, once said that "faith is simply trusting God's character, even when life gives you reasons not to." Considering that Corrie's Christian family perished in the death camps, she understood the reality of evil and what it means to remain loyal to God in a season of great suffering. Frankly, I find that words fail -- there is nothing anyone can say to lift the burden of pain in times of suffering. But I have known the comfort of a God who has been victimized by evil Himself -- He has firsthand experience with emotional and physical pain. He sees and He knows and He cares about our suffering. We have His promise that one day evil and pain will be permanently and absolutely behind us (Revelation 21:4). And we who have suffered because of it will be compensated forever if we are in relationship with him. Let's follow Him faithfully then, in spite of difficulties and injustices -- not because we know or understand everything, but because we know Him and believe He is good.